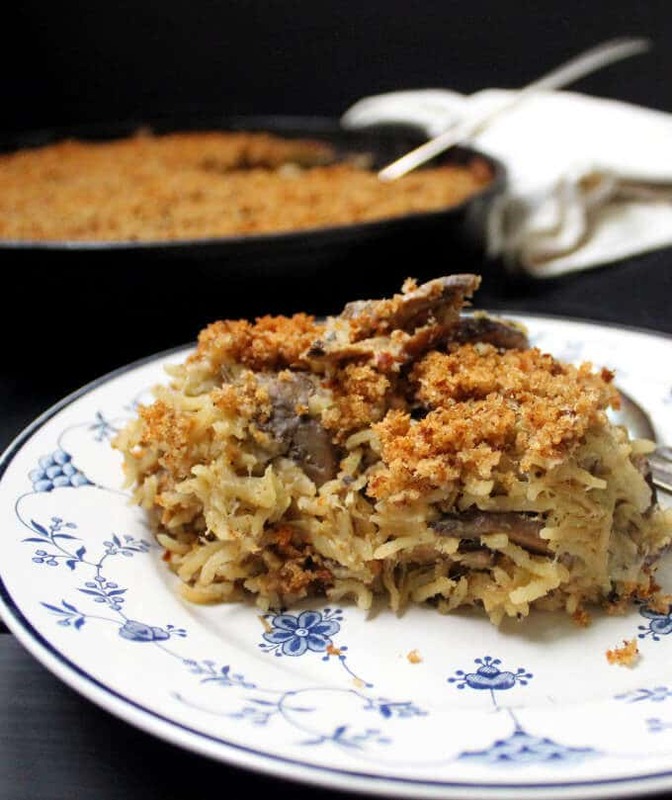 A Vegan Mushroom Rice Casserole that’s not only delicious and nutritious, it takes 15 minutes to assemble, and needs just one pot. A great weeknight option that’ll leave your family licking their fingers. 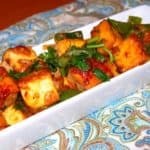 A soy-free recipe, can be gluten-free. We love rice in our home, and when it is creamy, gooey and filled with flavor from mushrooms and leeks and fresh herbs, it goes down doubly well. 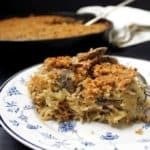 This creamy and vegan Mushroom Rice Casserole has become one of my favorite go-to recipes for weeknights. 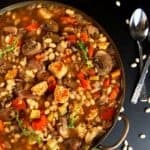 It needs a minimum of chopping and prepping and I use frozen mushrooms and dry wild mushrooms to add texture and flavor (fresh mushrooms work too, follow instructions below). Leeks form a delicious, oniony base along with garlic, and all of it bakes up in a creamy, decadent cashew sauce spiked with cheesy nutritional yeast. It is really difficult to mess up this dish. You can add some tweaks of your own, like what type of mushrooms and herbs you use. But don’t fool around with the rice-to-water ratio or the baking time because you want to be sure your rice cooks perfectly. 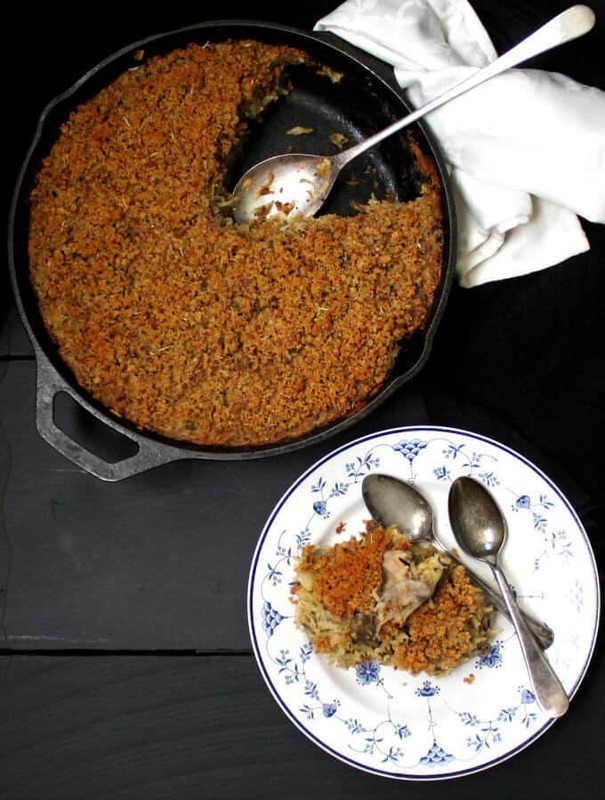 The casserole has a crunchy, whole-wheat breadcrumb topping that complements the creamy rice perfectly. 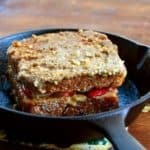 But if you want this dish to be gluten-free, you can either leave out the breadcrumbs altogether, or use gluten-free breadcrumbs. If you leave out the breadcrumbs make sure you keep your skillet or casserole dish covered with foil until the end of cooking. 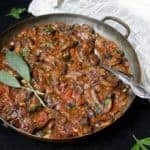 I love adding the dry wild mushrooms because they add a nice layer of texture, but if you are feeding someone who is not a big fan of mushrooms, just use more of the frozen kind — they melt into the casserole, and they’ll hardly notice them there. Here’s the recipe now. Let me know if you try it! 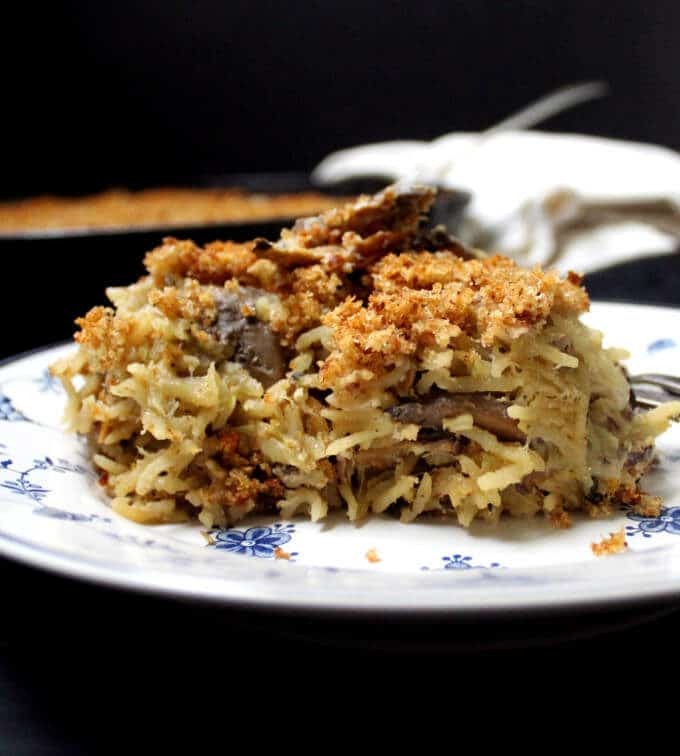 A Vegan Mushroom Rice Casserole that's not only delicious and nutritious, it takes 15 minutes to assemble, and needs just one pot. A great weeknight option that'll leave your family licking their fingers. 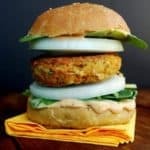 A soy-free recipe, can be gluten-free. 1-2 tbsp fresh herbs. I used a combination of basil and rosemary. Thyme, sage or mint would work here too. 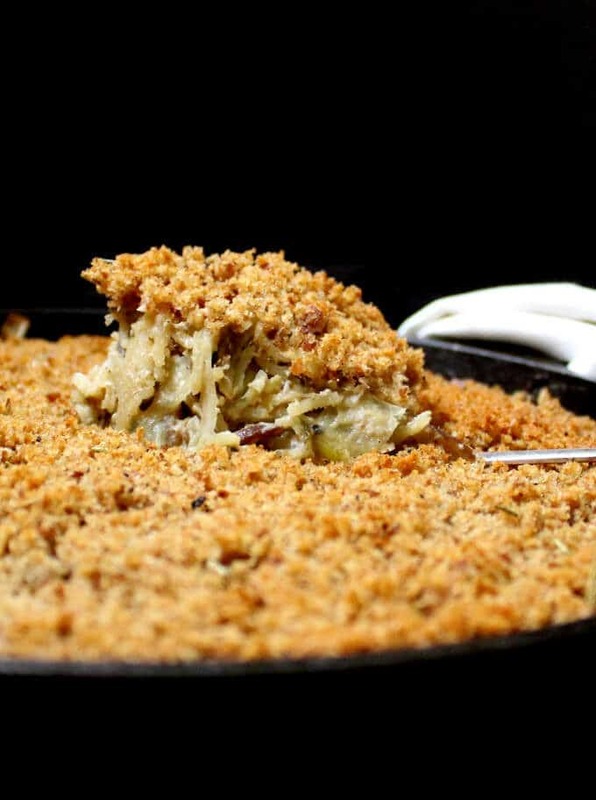 Place all the ingredients for the breadcrumb topping in a food processor or bowl and combine to mix well. Set aside. Place the dry mushrooms in a bowl and pour 1 1/2 cups of hot water to reconstitute. Leave alone for at least 10 minutes while you prep the other ingredients. Place the raw cashews in a blender along with the remaining 1 cup water, onion powder, nutritional yeast, dry rosemary and fried onions. Process into a very smooth paste. If you're not using a high-speed blender, you will need to soak the cashews first for 30 minutes before adding them to the blender. In a 12-inch cast-iron skillet, heat the oil. Add the leeks and saute over medium-high heat about 5 minutes or until they are soft and beginning to brown. 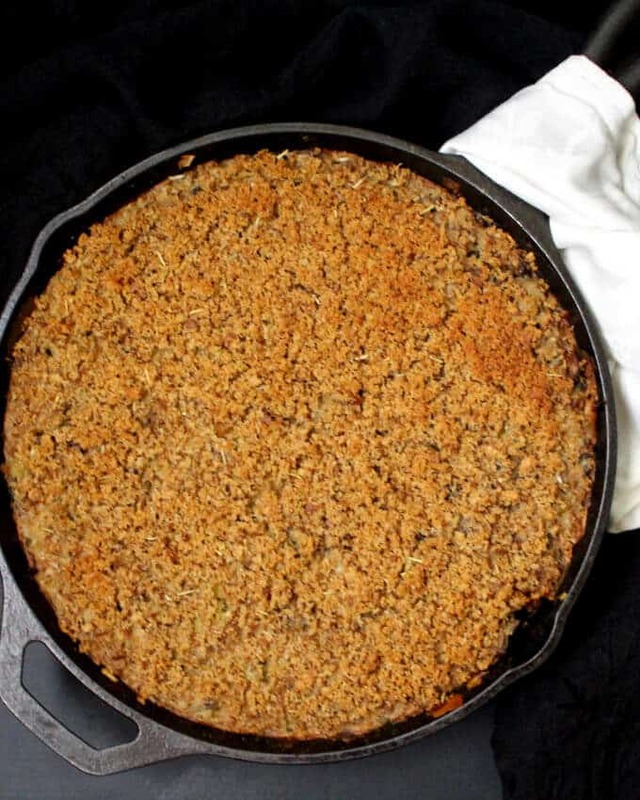 If you don't have a stove-to-oven skillet, use a skillet for the first seven steps and then pour the casserole ingredients into an oven-safe baking dish before adding the breadcrumb topping. Add the garlic and fresh herbs and continue to saute. Add the mushrooms, both the frozen and the reconstituted dry mushrooms. Reserve the stock from the mushrooms. Let the mushrooms continue to cook for another five minutes, stirring frequently. If you replace the frozen mushrooms with the fresh, make sure you saute the mushrooms until most of the moisture has evaporated from the skillet. This will add some more cooking time. Add the rice and cook another couple of minutes, stirring well to mix. Turn off the heat. Pour in the cashew cream sauce and the mushroom stock. Mix well and check seasoning. Add more salt and ground black pepper if needed. If you need to transfer your ingredients to a casserole dish, do it at this point. Spread the breadcrumb topping evenly over the top of the casserole. Cover the casserole with aluminum foil. 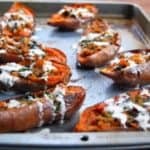 Place the skillet or casserole dish into the preheated oven. Bake 45 minutes, then remove the foil and continue baking another 15 minutes until the breadcrumb topping is golden. If you skip the topping, keep the foil on for the full hour of baking so your casserole won't dry out. 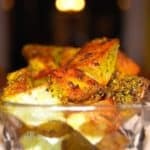 Remove the casserole from the oven, and let it stand five minutes before serving. 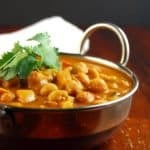 Can you suggest a work around for the use of brown rice? My doc said no more white rice. 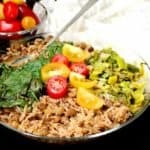 You can cook the brown rice till it’s about 70 percent done and then add it to the casserole. No need to add the rice in step 7, do it while adding the cream sauce and after you’ve turned off the heat. Cheers. Is the 1cup of rice cooked or raw? Raw! 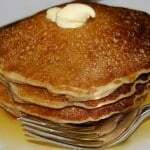 Clarified in recipe too, in case others have the same question. 350 degrees? celcius or fehrenheit please? Regular onions are fine, and use any kind of mushrooms– button, portobello, oyster, the teeny ones… they are all good here.